So here is my sonnet in her honour reflecting on how the meaning of her name, ‘light and clarity’, was also the meaning of her life. This sonnet is taken from The Singing Bowl my most recent volume of poems, which is published by Canterbury Press and available through Amazon etc. As always you can hear the poem by clicking on the ‘play’ button if it appears, or on the title. 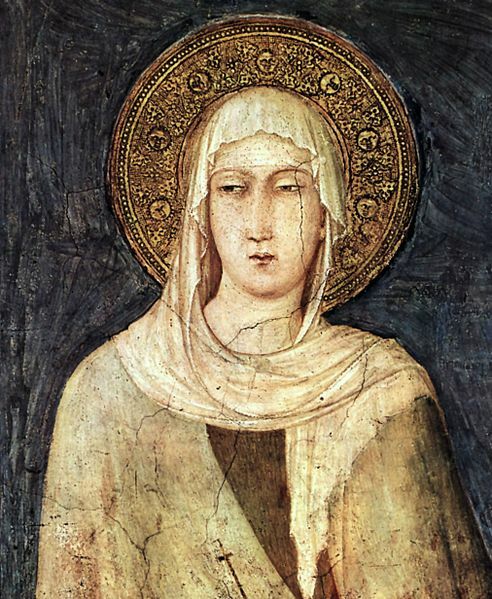 This Monday, August the 11th is the day the church remembers St. Clare, but I am posting my sonnet today as some churches might like to use it on the Sunday nearest her feast. She was the friend and companion of Francis, and founder of the Poor Clares. Her love for Christ, her share in the vision of St. Francis and her extraordinary gifts a soul-guide, friend, and leader made her a shining light and a clear mirror of Christ for thousands in her lifetime and still a light and inspiration to Christians from many denominations today. So here is my sonnet in her honour reflecting on the meaning of her name, and life as light and clarity. This sonnet is taken from The Singing Bowl my most recent volume of poems, which is published by Canterbury Press and available through Amazon etc. August the 11th is the day the church remembers St. Clare, friend and companion of Francis, founder of the Poor Clares, her love for Christ, her share in the vision of St. Francis and her extraordinary gifts a soul-guide, friend, and leader made her a shining light and a clear mirror of Christ for thousands in her lifetime and still a light and inspiration to Christians from many denominations today. Here is my sonnet in her honour reflecting on the meaning of her name, and life as light and clarity. This sonnet will appear in my next volume of poetry The Singing Bowl to be published this November by the Canterbury Press. As always you can hear the poem by clicking on the ‘play’ button if it appears, or on the title.